While it’s never easy, the divorce process doesn’t have to be hellish. Christina Pesoli—a professional divorce coach and author of Break Free from the Divortex: Power Through Your Divorce and Launch Your New Life—offers ten practical survival tips to help women navigate the perils of divorce and return to solid emotional ground. There are a staggering 876,000 divorces each year. As more and more women endure these messy, devastating divorces, they find themselves sucked into the “Divortex,” a black hole of despair fueled by legal issues, personal stresses, strained relationships, and the pain of putting lives back together. While it’s never easy, the divorce process doesn’t always have to be hellish. Christina Pesoli is a professional divorce coach, an attorney, a HuffPost Divorce columnist, and the founder of Emotional Hardbody. 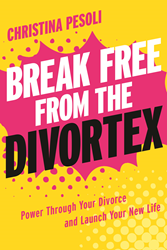 In her empowering new book, Break Free from the Divortex: Power Through Your Divorce and Launch Your New Life, she acts as therapist, lawyer, drill sergeant, and best friend to deliver the guidance women need to come out on top—with their finances and their sanity intact. 1. Don’t stay sad: If given the choice between being mad and sad, be mad. Anger can actually be a good thing. Sadness saps strength, but anger has power. Use the anger as fuel to get constructive things done and propel yourself forward. 2. Be a good client: If your lawyer needs information by a certain date, make sure you provide it on time. If your lawyer recommends knocking off certain behavior, knock off that behavior. If you don’t understand what your lawyer is asking of you, or why she’s asking it, get clarification. 3. Get a divorce role model: Pick someone who got divorced some time ago, conducted themselves reasonably well throughout the process, then regrouped and moved on. Whenever you’re feeling rattled by your uncertain future, think of your divorce role model and take comfort that you’re heading in that direction. 4. Recruit your “A” Team: Ask your two most trusted friends to be on your “A” Team. Then, rather than blabbing indiscriminately about your divorce, limit your venting to them. 5. Don’t date until your divorce is final: Dating triggers a lot of emotions and the last thing you need during your divorce are more feelings in an already volatile mix. For things to go as quickly and as smoothly as possible, wait to date—even if a soon-to-be ex is already playing the field. 6. Don’t manufacture evidence against yourself: A divorce is a lawsuit, and character matters—especially if custody of your kids is at issue. Your ex may be motivated to portray you as crazy. Don’t help him out by manufacturing evidence that he can use against you. Don’t post photos on social media of you and your BFFs doing Jell-O shots at happy hour. And don’t send him drunk texts at crazy o’clock. 7. Be your own best friend: When a friend is going through something hard, you step up to help her persevere. In this case, you're the one who needs the support, but you should also be the one giving it. Fill your spare time with interesting activities and constructive pursuits. Cut yourself a break if you’re not operating at 100%. 8. Don’t divorce your kids: You are divorcing your husband, not your kids. Divorce presents an opportunity to redefine who you are, but your role as mom is permanent. 9. Don’t lose custody of your sense of humor: Divorce is more tragedy than comedy, but it’s still important not to lose your sense of humor throughout the process. There will be plenty of things for you to cry about, but there will also be things to laugh over, too. Embrace them! 10. Don’t worry about being friends with your ex: If you’re worrying about whether you and your ex will ever be friends, you are still trapped in the divortex. If you’re supposed to be friends with him, it will happen in due time. If not, the world is full of potential friends for you. Move forward and find them.